The Busy Nails Creating beautiful manicures, one day at a time. 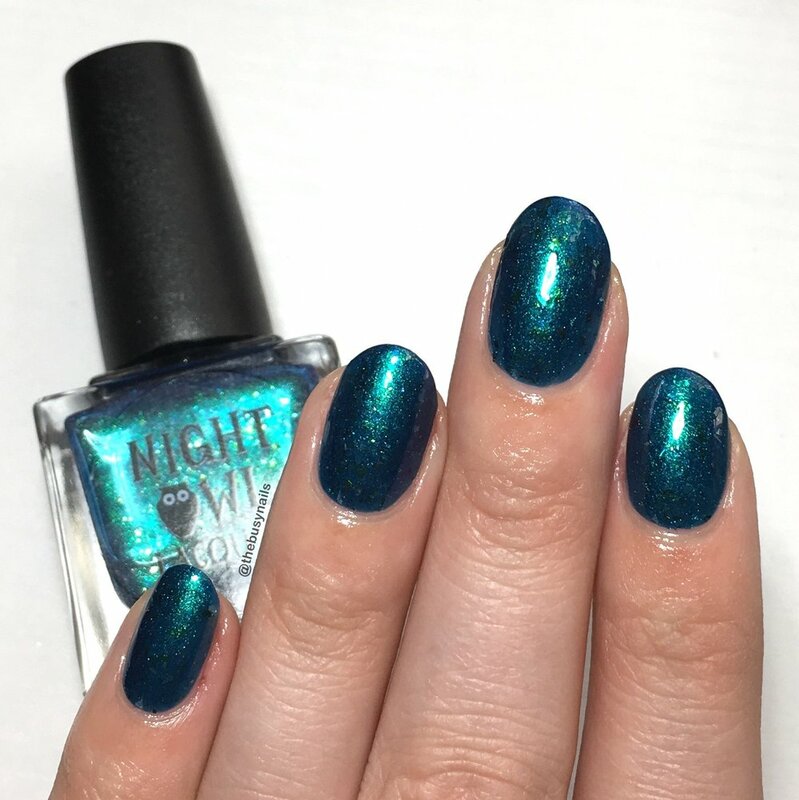 Night Owl Lacquer "Night Magic" is a Facebook group custom that Lindsay created just for members of the Fantasmic Flakies group, which is exactly what it sounds like - a group dedicated to loving flakie polishes! This releases Saturday, January 6th at 12 PM MST in the Night Owl Lacquer shop and will be available for one month. All photos in this post are taken under artificial light. All shiny swatches are topped with Glisten & Glow HK Girl topcoat and matte swatches are topped with Glisten & Glow matte topcoat. This polish was provided for my honest review. Maker description: a dark indigo base with a green to blue to purple shift, white crystal flakes, green crystal flakes & green/blue/violet shifting ultra chrome chameleon flakies. Formula: I've been very pleased with all the NOL polishes I've tried, and the same if true for this one. Even with a TON of shifting pigment and flakes, this still went on very easily. My thoughts: This polish couldn't be more perfectly named. It's dark, yet bright, and pretty damn magical. When I first saw the bottle, I oohed and ahhed over it! The shift is really strong and easily seen as you move your fingers around. This is one polish that will easily distract you! This first set of photos was taken under direct artificial light with shiny topcoat. Had to show all the shifts side by side. So pretty! 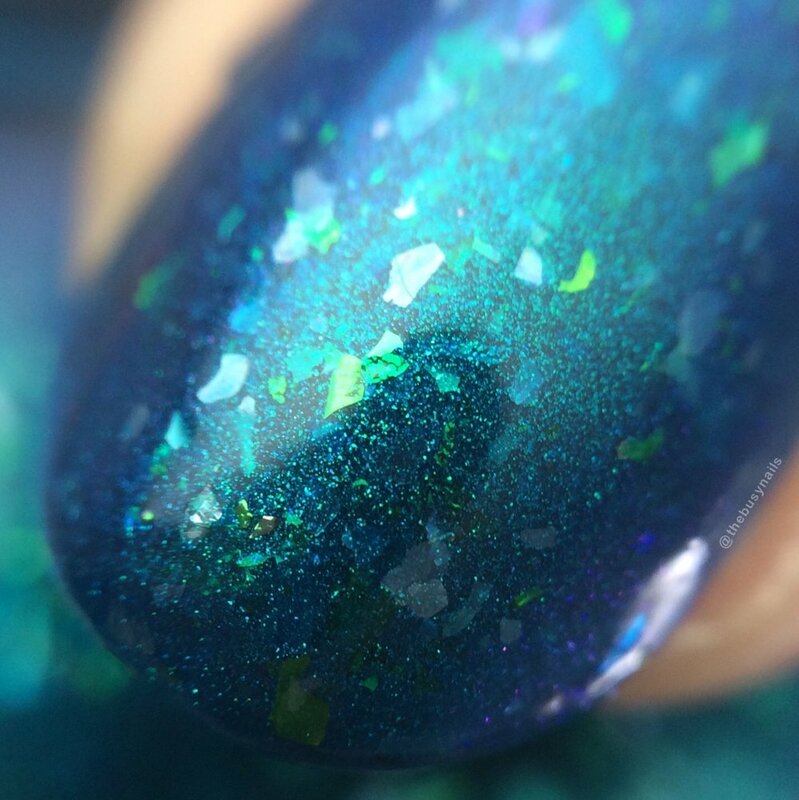 These next photos were taken in a lightbox with matte topcoat to show off the flakes. You can buy this beauty for $10, for one month only on the Night Owl Lacquer website starting Saturday, January 6th at 12 PM MST.